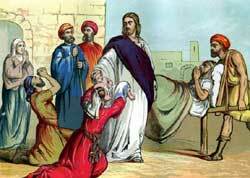 People bring their sick folk to Jesus to be healed, and Jesus healed every one who has brought to him. LEAVING PHOENICIA,Jesus and his twelve disciples journeyed around the country on the eastern side of the Sea of Galilee. In this same country Jesus had healed the man in whom a legion of evil spirits had dwelt, and had sent the evil spirits into the herd of hogs that fed on the mountain-side by the Sea. And the people had run out excitedly from the cities near by, to see Jesus and ask him to leave their land. And Jesus had gone away.But the man who had been healed by Jesus had returned home to tell his friends about the wonderful Healer of Galilee, and everywhere he went he spoke of the power of Jesus that had made him well. And the people became interested. They saw the great change that had come over the man whom they used to fear, and they felt sorry that Jesus had been sent away. Now when Jesus returned the second time with his twelve disciples, a multitude of eager people gathered to see and hear him. They followed him to a dreary country place and for three days listened to his teachings, and brought their sick folk to him to be healed. And Jesus healed every one who has brought to him. “How can we feed them all in this desert place?” asked the disciples. Jesus then turned to the multitude and commanded them to sit down. When they had obeyed he took the loaves and fishes and blessed them, just as he had done when he fed the five thousand from the boy’s lunch-basket. And again the loaves and the fishes increased until there was food enough for every one. More than four thousand people were fed by this miracle, and seven baskets of food remained after all had eaten their fill. Then Jesus dismissed the multitude, and they returned to their homes with their sick folk made well. How glad they were that Jesus had come the second time to visit their country! Now they rejoiced with the man out of whom Jesus had cast the evil spirits; for they, too, had been blessed by the Healer of Galilee. From this place Jesus went with his disciples in a ship to the country on the north side of the Sea of Galilee.